Artist Kerri Rosenthal is all about happy - and about sharing the exuberance she feels about color through her art. I’m happy to be working with Kerri this Valentine’s Day season to share the love that her Drippy Heart paintings are all about. Kerri has been painting hearts for several years, she felt it was time to make them more accessible and available, and has introduced a collection of three of her Drippy's as limited edition prints. We spoke recently about why these seemingly simple, straightforward, pop-art works are so well-received. Kerri attributes much of their appeal to color - she “loves vibrant color”, and says, “I love how I feel when I look and sense bright color and sunshine. I want to feel that way all the time, so I paint it! 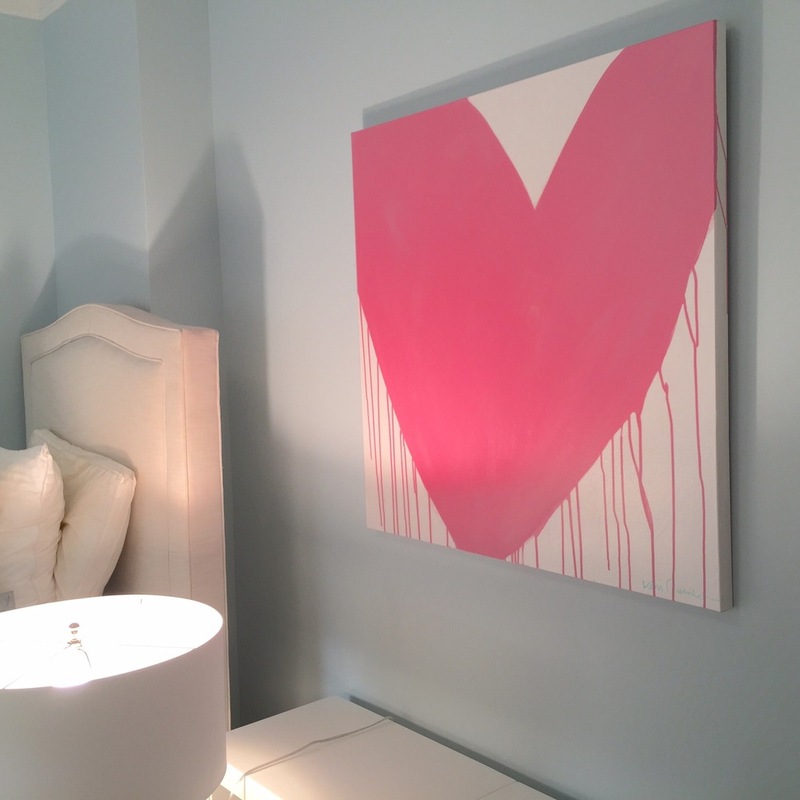 Drenched in Love, was the first Drippy Heart, installed in a welcoming entry, designed by D2Interiurs (Kerri is the Creative Director of the CT-based interior design firm when she isn't in the studio painting). I am very expressive with my bold colors and layers of paint and oil crayon. This expressiveness led to the Drippy Heart Collection. The collection has evolved from that love of color and the universal meaning of the heart, it’s love and happiness.” This has translated into artworks (take a look at her site to see more) that her customers are just as passionately hanging in their homes. 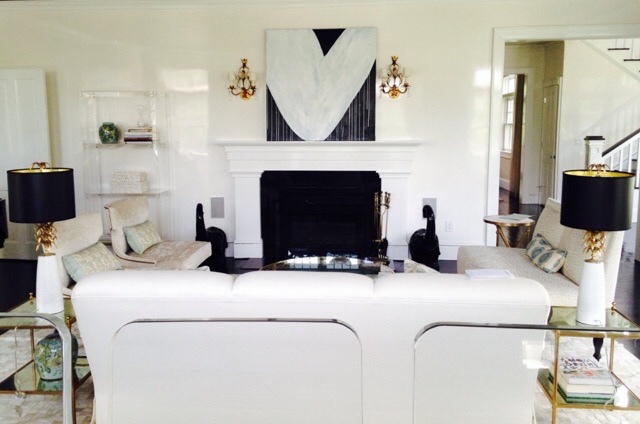 The yellow heart compliments the bold cobalt and white modern room also designed by D2Interiurs. Our conversation led to SAD (Seasonal Affective Disorder), the condition that causes people to feel a bit down in the grey winter months, some more seriously than others. Kerri talked about the importance of light and color in the winter. For her, the greyer and bleaker the weather, the more she gravitates towards painting brighter colors. It brings her joy. And joy is what one of the artists who has influenced Kerri the most wanted to bring through his work. The renowned modernist painter, Ellsworth Kelly, is known for his bold primary colored artworks. Years ago, Kerri reflected about the effect one of his yellow paintings had on her - she wondered what it was, "is it a flower, a tulip?”, but realized the subject didn't matter, what she responded to was the intense strong color, it made her happy. Kelly painted solid yellow forms from the 1950’s until his recent passing this past December at 92 years old. Yellow, White, 1961. Kerri intuitively knows what color theorists say about the sunny hue. According to Kate Smith of Sensational Color, “Yellow shines with optimism, enlightenment, and happiness. Shades of golden yellow carry the promise of a positive future. Yellow will…instill optimism and energy, as well as spark creative thoughts” Interior Designer Amanda Nisbet must feel the same way, from a recent feature in Domino Magazine. When we spoke, Kerri continued, “ I wear my heart on my sleeve, what I feel, I paint. I love strong color, I am very expressive with my bold colors and layers of paint and oil crayon”. In her words, her style is a bit "messy, imperfect” - and the drips and sprays of water on her canvases reflect that. A look at Kerri in her "happy place". We talked about the type of person that loves the heart paintings - but, there is no description or "type". 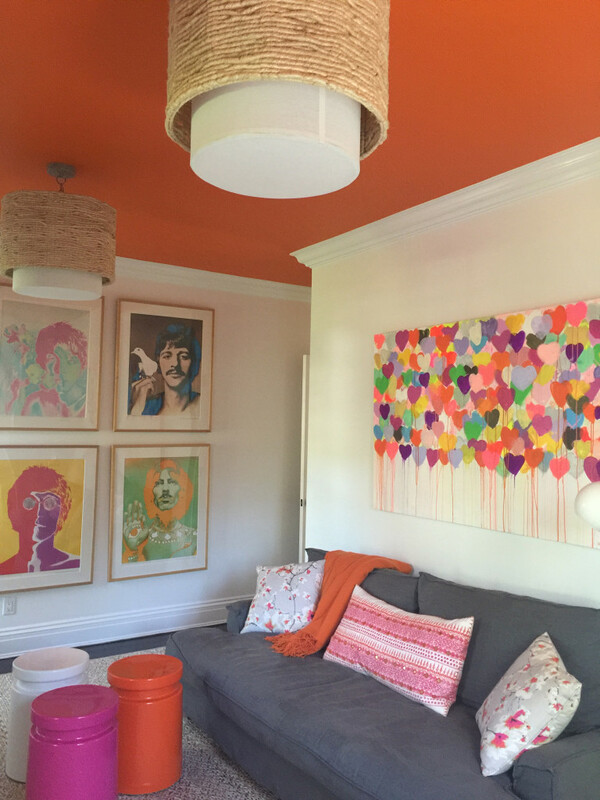 The “drippy’s” are hanging in a variety of homes, from this grand entry, the color in Sea of Hearts pops in an otherwise traditional home, the contrast is striking! I enjoy the reaction that people have to the hearts, “they make me happy or, they make me smile”. I loved the response from the family that spends their time in this room, designed by Susan Carlson Interiors. My client called the morning after the painting was installed, to tell me that her young son said, “Mommy, I love your heart”! 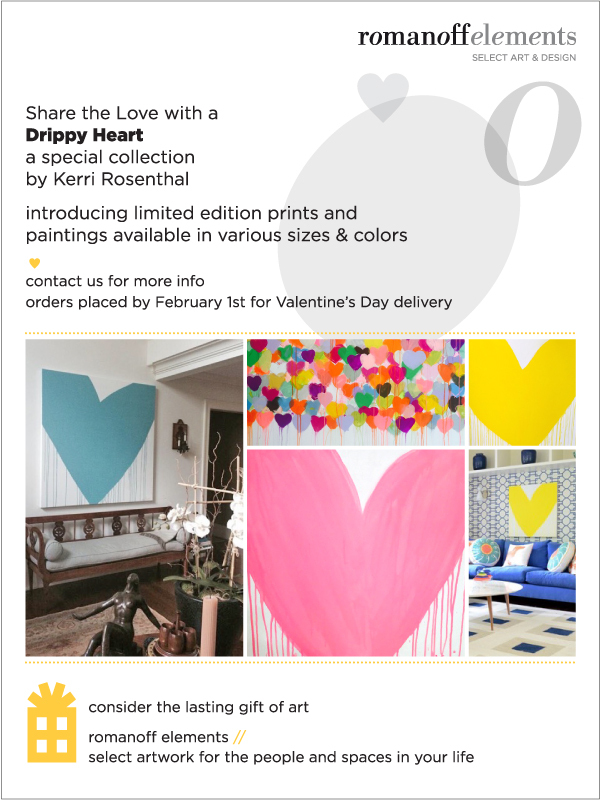 We introduced the limited edition prints for Valentine’s Day, so Kerri can further "Share the Love". There are 3 archival signed prints, each in a limited edition of 100, available framed or unframed. In addition there are heart paintings available in a range of colors and sizes from 12"x12" to 60" sq. 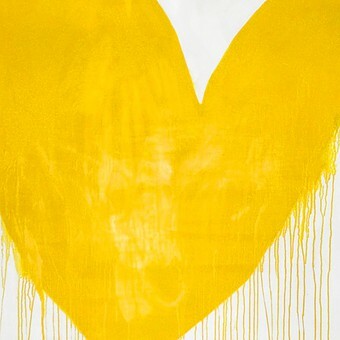 All of My Love, available 30"x40" or 40"x60"
The Drippy collection evolved from Kerri’s strong feelings for color and the universal meaning of the heart, it’s love and happiness. If you want to Share the Love, email me with inquiries or click here to see more! Wishes for a Happy Valentine's Day, filled with the ones you love!